The PA10W, PA15W, PA75W and PA100W RF power amplifier modules are capable of providing 10 W, 15 W, 75 W and 100 W RMS power respectively. They are equipped with blanking/enabling circuitry which keeps the modules blanked (turned off) until a TTL signal (logical high) is applied. The blanking/enabling circuitry helps to conserve power, keeps the amplifiers cool under typical operating conditions, and provides noise reduction during the reception of NMR signals. The TTL signal is asserted on a 10-pin male IDC header which can be easily connected to the TTL output from the RadioProcessor™ USB boards. 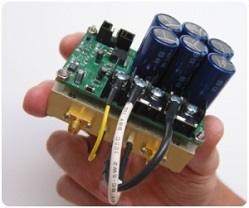 The PA10W RF power amplifier is a very compact broadband module delivering 10 watts into a 50-ohm load. It has a 3 dB range of 10 MHz to 75 MHz and the control board is powered by a DC +12 V power supply. 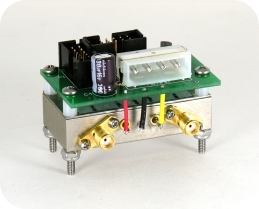 The power amplifier has standard female SMA jacks for RF input and output, and a standard 4-pin ATX connector for the input DC power. It typically operates in Class AB. The entire product comes in a very small form factor measuring 2.25" x 1.4" x 1.4" (57 mm x 36 mm x 36 mm). PA10W module with deblanking circuitry, no enclosure. The PA15W RF power amplifier is a very compact broadband module capable of delivering more than 15 watts into a 50-ohm load. It has a 3 dB range of 4 MHz to 100 MHz and the control board is powered by a DC +12 V power supply. The power amplifier has standard female SMA jacks for RF input and output, and a row of screw terminal connectors for the input DC power. It typically operates in Class AB. The entire product comes in a very small form factor measuring 2.5" x 2.75" x 3.0" (63 mm x 70 mm x 76 mm). PA15W module with deblanking circuitry, no enclosure. The PA75W RF Power Amplifier has maximum continuous power, in excess of 200 Watts Peak Envelope Power (PEP) in pulsed mode. It has a frequency range of 1 MHz to 30 MHz 3 dB bandwidth. The PA100W RF Power amplifier comes in a very compact broadband module delivering 100 watts into a 50-ohm load. It has a frequency range of 10 MHz to 100 MHz and is powered by a DC 24-28 volt power supply. The PA100W module has standard female SMA jacks for RF input and output, and a screw terminal block for the DC power input. It typically operates in Class AB. The product comes in a small form factor measuring 3.15" x 2.54" x 2.33" (80 mm x 65 mm x 59 mm). Standard Warranty- 1 year from Invoice date.